In 1957, the City Utilities of Springfield, MO, commissioned a pneumatic distributed control system for its James River Power Plant. 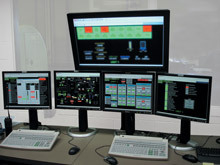 At that time, the plant was considered very advanced because it utilized a centralized control room for operations, instead of a series of separate control stations located throughout the facility. "Through the years since," explained Maintenance Manager Steve Stodden, "We had attempted to keep the existing system functional, but maintaining a 50-year-old system has proven difficult. Several years ago we started discussions with all plant personnel involved about upgrading the old control system to improve the safety of the plant and to take advantage of modern digital technology. The result is that we now operate our five generating units with varying stages of a new CS 3000 control system from Yokogawa." "Our evaluation of competing vendors was based on consideration of a combination of factors with (the) awareness that the new system will probably be in place for decades until the current facility is retired," said Stodden. "We had to be confident of the vendor's support during this extended future time period." With the vendor selected, system details were then examined. The initial bid was based on 4-20 mA protocol but replaced by FOUNDATION fieldbus™ as advantages of FOUNDATION fieldbus™ emerged. The plant has five generating units with a total capacity of 253 MW – two 22 MW, one 44 MW, one 60 MW, and one 105 MW. "We decided to handle all the new-system installation in-house," said Stodden. "That way our personnel would be very familiar with everything involved. We were delighted with how smoothly the entire procedure went, and we completed installation in only six weeks. We had virtually no problems with the CS 3000 hardware or software. Our biggest obstacle was moving the electrical interlocks required to combine the two control rooms into one. If the Yokogawa system had not worked so well, we would never have made our startup dates." "Originally," he continued, "Units 1 and 2 were housed in one control room, while Units 3, 4 and 5 were housed in a separate control room. As part of this project, we combined these into one. The new system has worked so well, that we now utilize one control operator to run both Units 1 and 2, where before each unit had a dedicated control operator assigned to each unit." "Units 3, 4 and 5 use a 'hybrid' configuration. These units are equipped with an older control system platform, utilizing Hand-Auto Stations for operator interface. This control system, while dated, is still supported. 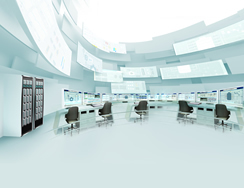 Therefore, as a step toward uniformity among the units, we utilize the Yokogawa Operator Console Platform to communicate with the older control system hardware already in place. The operators see the same style of operator screens as Units 1 and 2, without realizing that it is utilizing a completely different control system. Annunciators and selected other functions work directly from the CS 3000 control; control loops are displayed on the CS 3000 screens but are processing existing control loops through an interface." When asked about acceptance by operators of the new electronic system, Stodden illustrated by quoting one of the men who initially said he thought the '...new system was the worst decision we had ever made.' But within two months after startup, the same operator asked 'When are we going to do the other three units?' Suffice it to say that by now our operators are very comfortable and pleased." The CS 3000 system has provided the ability for automatic control sequences not previously practical. For example, shutting down a coal feeder used to require many control manipulations to maintain safe operation of the boiler. The entire sequence is now automatic. "We just hit a key and sit back to watch everything progress through the control sequence," says Stodden with a satisfied smile. The plant, which celebrated its 50th anniversary this year, consists of five coalfired boilers equipped with steam turbines and two natural-gas-fired turbines. The plant initially was designed to utilize natural gas as its primary fuel, with coal as a winter backup fuel. This switched during the late 1970's driven by the Powerplant and Industrial Fuel Use Act of 1978. The station now utilizes less than 1% natural gas for fuel for the steam boilers. Ultra Low-NOX burners and Overfire Air were installed recently to greatly reduce nitrogen oxide emissions in preparation for EPA standards that go into effect in 2009. All units of James River Power Station remain capable of burning either 100% coal or 100% natural gas in order to produce electricity. The plant currently supplies slightly more than half of the electricity generated by City Utilities. Forced outages at the plant during the last three years have averaged slightly more than 1%, which is approximately one-fifth of the national average.